SAG VEHICLES provided for you and your bike if you are unable to complete the ride. 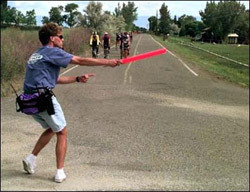 BIKE TECHS available to assist you at the ride start and all aid stations. Riders should carry (and know how to use) equipment to patch and change tubes. Our thanks to each of our bicycle repair vans Wheat Ridge Cyclery , Cenna’s Custom Cycles , Republic Cycles Boulder , Ltd Cycleworx , Mobile Bike Man , and velofix (Boulder/Fort Collins) . 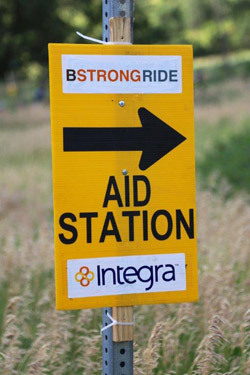 MEDICAL SUPPORT - B Strong has gone to great lengths to assure your safety on this ride. Ambulances, medics and radio-equipped staff will patrol the route. 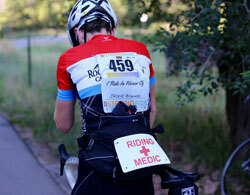 Our thanks to Stadium Medical for providing ambulance coverage and the physicians, nurses, paramedics and EMTs of Boulder Community Health and University of Colorado EMS for serving as vehicle and bicycle-based medics.